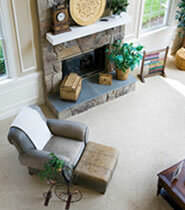 Quality carpet and other flooring products: Benicia Floor Co. The most durable and common synthetic carpet material is nylon. Nylon represents about 80% of residential carpet installations. Polyester, Olefin, and Polypropylene comprise the rest of the synthetic options. Wool is a natural product that is luxurious and durable and is also the most expensive carpet material.